Weight: 9 - 12 pounds. Body Type: Slate blue or white. 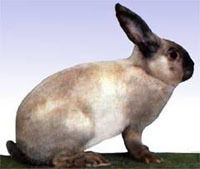 This rabbit has well-rounded hindquarters, narrow shoulders, and long erect ears. Weight: 3 to 4 pounds. 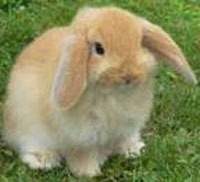 Body Type: These small rabbits have a large, flatted "bulldog" face and lopped ears, and look somewhat like a Holland Lop with long fur. They have been bred in many different colors. Special Care: This is a wool breed and will require extensive daily grooming and a special diet. Weight: 7 - 10 pounds. Body Type: Nose, ears, feet, and tail very fark brown, body a sepia color. Body is medium long and full, head narrow, and ears long and erected. Weight: 5 to 7 pounds. 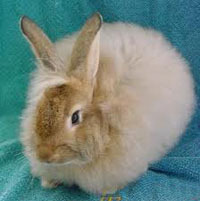 Body Type: Thick wool covers the entire rabbit, including the face and the stand-up ears, giving in the appearance of a large fuzz-ball. They have been in many colors. Special Care: These rabbits require special diets and extensive daily grooming. Weight: 7 1/2 to 10 1/2 pounds. Body Type: Medium long rounded body, ears long and erect. 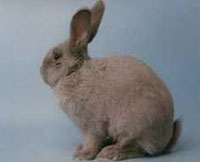 Face, ears, and front feet have short fur; rest of body has very long wool. Many different colors have been bred. 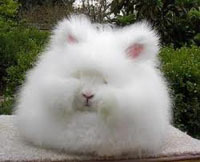 Special Care: This rabbit must be fed a special diet and carefully groomed every day. Weight: 6 - 9 1/2 pounds. Body Type: This rannit has a lean racy body that looks more like a hare's than a rabbit's. Large upright ears. Special Care: Some rabbit owners claim it is more prone to bone fractures if mishanddled, due to the bosy type. Weight: 8 - 12 pounds. Body Type: Pear-shaped body, long erect ears, dense coat of black, blue, or white. Weight: 2 - 2 1/2 pounds. 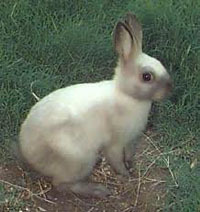 Body Type: These tiny, compact rabbits have relatively narrow heads and a trim, arched body line. Ears are medium long and erect. Colors include white, black, otter, chesnut, agouti (like a wild rabbit), and sable marten. Special Care: Experienced rabbit breeders have claimed these rabbits have a tendency to be more hyper and nip more than other breeds and that they require especially careful handling because of the delicate arched body type.